As project management software, Microsoft Project allows you to oversee your business activities effectively. You can manage resources, share project info, perform modeling and scenario analysis, and standardize reporting processes. This easy-to-understand guide is completely updated to cover the latest changes and newest enhancements to Project 2010 and shows you how to get Project 2010 to work for you. After an introduction to basic project management concepts, you’ll discover the mechanics of using Project software to create and manage projects. Other topics covered include working with calendars, using and sharing resources, budgeting, formatting taskbars, gathering and tracking data, working with reports, and creating templates. 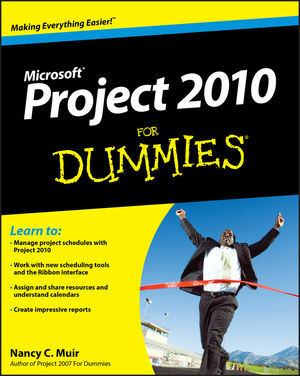 Let the friendly For Dummies writing style guide you through maximizing the new features of Project 2010. Nancy C. Muir has written more than 50 books on technology and business topics including Windows, Office applications, PCs, laptops, and Internet safety. She has presented workshops to Fortune 500 companies on project management and related software. Her credits include more than a dozen For Dummies books. Part I: Setting the Stage for Project. Chapter 1: Project Management: What It Is, and Why You Should Care. Chapter 2: The Best-Laid Plans. Chapter 3: Mark It on Your Calendar. Chapter 4: A Tisket, a Task Kit. Chapter 5: Getting Your Outline in Line. Chapter 6: Timing Is Everything. Part II: People Who Need People. Chapter 7: Optimizing Your Resources. Chapter 8: What’s All This Gonna Cost? Chapter 9: Assigning Resources to Get Things Done. Part III: Well, It Looks Good on Paper. Chapter 10: Fine-Tuning Your Plan. Chapter 11: Making Your Project Look Good. Part IV: Avoiding Disaster: Staying on Track. Chapter 12: It All Begins with a Baseline. Chapter 13: On the Right Track. Chapter 14: A Project with a View: Observing Progress. Chapter 15: You’re Behind: Now What? Chapter 16: Spreading the News: Reporting. Chapter 17: Getting Better All the Time. Part V: Working with Enterprise Projects. Chapter 18: Project Web App for the Project Manager. Chapter 19: Project Web App for the Team Member. Chapter 20: Ten Golden Rules of Project Management. Chapter 21: Ten Project Management Software Products to Explore.